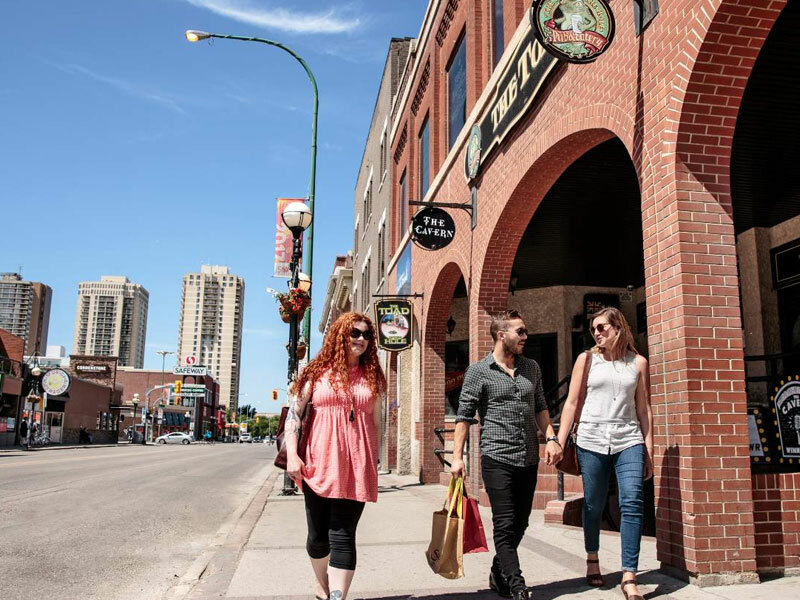 Discover Osborne Village, located just over the river from the Legislative Building and downtown’s Broadway Avenue. The area is home to many of Winnipeg’s emerging and well-established artists, and is one of the city’s highest density populated neighbourhoods. If you’re strolling into the area from downtown, enjoy the public art that has been integrated into the Osborne Bridge design to emphasize the eclectic nature of the neighborhood. The bridge is a major river crossing and one of Manitoba's busiest routes for vehicle, cyclists, and pedestrian traffic. The Village permeates an artsy vibe and features some of the city’s best live music dive bars and watering holes, along with more restaurants than one can imagine. All along the main strip you’ll find swish and bohemian shopping, jewellers, a record store with a sweet collection of vinyl, yoga studios, and the Gas Station Arts Centre, a gem of a theatre that is known for comedy. Segovia Tapas Bar is frequently cited by both local and national media alike as Winnipeg’s best restaurant. Chef Adam Donnelly’s tight, often-changing menu brings huge flavours with items like lamb dumplings, croquetas, and tuna tostadas. The cocktails are also great, as well as a curated wine list that is ideal for summer sipping on their gorgeous little patio. For nightlife, The Toad in the Hole Pub just may be the pick of the pool. It features a whisky bar with more than 160 whiskies from around the globe, while downstairs The Cavern frequently hosts great bands in an intimate (and a touch loud) environment. Other evening spots include OV Club and Upstairs in the Village. A brunch spot of note is Stella’s Café & Bakery, a tested and true nouveau Winnipeg institution. And you can’t do Osborne Village without some sweets from the iconic Baked Expectations. Their shmoo torte – a Winnipeg specialty that involves angel food cake layered with pecans and a ridiculous amount of whip cream and caramel sauce – is a thing of legend, and a must for any visiting culinary tourist. Shopping is all the rage in the Village, with Out of the Blue being a real standout. This place has grown from a vintage clothing shop in the early 90s into one of the top spots for fun, fashion-forward looks and accessories. Other mainstays are Rooster Shoes, where the cool kids find fine fashions for their feet, and Music Trader, with its vast selection of vinyl, casettes, and CDs. Osborne Village’s Canada Day Street Festival is Winnipeg’s largest and longest-running annual street festival. It is always epic as the entire strip is converted for pedestrian traffic only for one massive street party brimming with music, food and local vendors.